People visit the Ministers' Building, formerly known as the Secretariat building, where General Aung San and eight others were assassinated, during an event marking the anniversary of Martyrs' Day in Yangon, Myanmar, July 19, 2015. The Myanmar public got a glimpse into one of the country's darkest moments on Sunday as visitors were given rare access to the compound where Aung San, the country's independence hero and father of opposition leader Aung San Suu Kyi, was killed. Aung San has remained a powerful force in Myanmar's politics in the 68 years since his death. His image has been used not only by his daughter but also her apolitical rivals to give themselves legitimacy and gain popular support among a public that still largely reveres the fallen leader. As Myanmar heads toward a crucial election on Nov. 8, his image is poised to become a campaign tool among hopeful politicians. Security officers watched on Sunday as hundreds of visitors, some wearing black ribbons and carrying flowers, scrambled up staircases at the Secretariat building in Myanmar's largest city of Yangon and held their phones through broken windows to take pictures of the compound's sprawling courtyard. People hold General Aung San's portrait as they wait to pay respect during an event marking the anniversary of Martyrs' Day outside the Ministers' Building, formerly known as the Secretariat building, in Yangon, Myanmar, July 19, 2015. For most it was their first time inside the building that had been off limits to the public for decades. While grateful of the chance to step inside, some remained critical of the past government's efforts to keep the public at bay. "They should know that even if they lock the building in which our national heroes were assassinated, they cannot erase them from our hearts," said Aye Lwin, 58, a visitor. 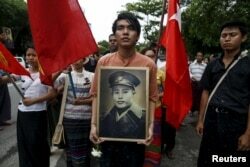 Aung San fought with the Japanese against the colonial British who ruled Myanmar, then Burma, during World War II, before switching sides to drive out the Japanese and set Myanmar on the path to independence. On July 19, 1947, Aung San, 32, was gunned down along with several colleagues by political rivals as they held a meeting in the Secretariat. The assassination plot has never been fully explained. A year later, Aung San's dream of an independent Myanmar was realized. In death, Aung San became a symbol of Myanmar's struggle for independence, but use of his image was curbed by the military junta starting in 1988 for fear of bolstering his daughter who had returned to Myanmar from England and emerged as the leading figure in the country's democracy movement. A quasi-civilian government that took power in 2011 began easing restrictions on media and political activity, fueling a resurgence in his image. Last year, the public was allowed into the Secretariat for the first time on July 19, known as Martyrs' Day. It remains closed to the public the rest of the year.